Building design is all about responding creatively to constraints. In south London, our primary constraint is inevitably the size of the plot. Our site is a typical urban infill plot. It was originally part of a back garden that reached down to its own road frontage. In London, most of these sites have already been developed so we are lucky to get our hands on this one. 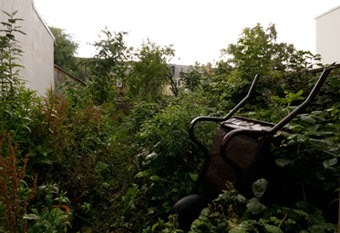 Arguably we are ‘garden-grabbing’ but the bit of land we are grabbing has not been cultivated as a garden for a long time and a good part of it is occupied by a crumbling garage. Nonetheless in the height of summer the site does look like a little verdant wilderness with the brambles, ground elder and buddleja competing for light. I also know that it’s home to foxes as well as a multitude of smaller fauna, creeping and crawling in the shadows. So when we come to clear the site we will immediately be in ecological deficit, wiping out a little niche of happy south London biodiversity. A key goal of the project is to ensure that, in time, this biodiversity is restored. The site is six metres wide and 25 metres long, so we have a total of about 150 square metres to play with. To the left, there is the flank wall of an existing house that we will be building right up against, turning it from detached to semi-detached. To the right, there is only a garage and another undeveloped garden. The house to the left is to the south, casting our site in shade. Nonetheless, we are determined to grab every ray of sun that we can for heating, power and horticulture. For example, the first floor conservatory at the front of The Orchard is positioned so that it will warm up quickly every morning in the eastern light. Exposed bricks and tiles inside this space will hold onto the heat as the sun moves behind our neighbour’s house. When faced with a small site, the temptation is to squeeze the biggest possible house on to it. This is inevitably what developers seek to do – the more bedrooms, the bigger the sale price – but lots of self-builders are guilty of it too. We have deliberately taken a different tack. Rather than building a three, four of five storey house, all of which are possible on the site, we are building a two storey house with only two bedrooms. After all, there are only two of us, we have no plans to extend our family beyond celebratory kittens when the house is finished, and we want to live here for ever (so we don’t care what the resale value is). The payback for not being too greedy with floors and bedrooms is that we have some flexibility to make the interior spaces a bit special. For starters, we can make a feature of the staircase in our main living space because we don’t have to protect it with fire doors, a building regulations requirement once you reach three storeys. We can also make the ceiling heights higher: the ceiling of the first floor study will rise so high, following the pitch of the roof, that we can fit in a double height book cases at its highest point. The conservatory roof will also be unusually high enabling our grape vines to catch the sun for longer. The total floor area of The Orchard will be about 100 square metres. Compared to what many people in London live in, that’s palatial. Right now we are saving money by renting a bedsit that is only 2.5 metres wide, a space that has challenged us to recallibrate our lives and think very hard indeed about how best to use interior space. When we finally move to the six-metre-wide Orchard, we will spill about in amazement. It was next door! So I cut a deal with our neighbour. Single plots are hard to find in London, no question. Good luck.